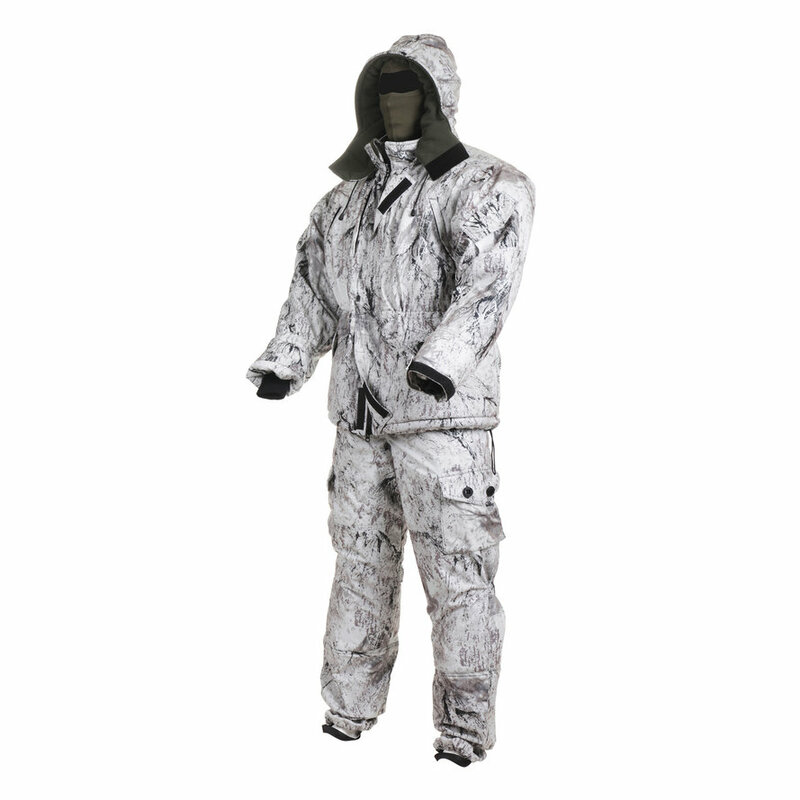 We bring to your attention a magnificent suit "Gorka", made in the actual camouflage coloring "Snow Storm". This set of clothes will be able to be appreciated by hunters, huntsmen, game hunters – people for whom it is important that their winter costume have not apparent, but real masking qualities. The “Snow Storm” picture has a powerful masking effect: in a snowy shrub, in the shade of trees in the snow, a person in such a “Gorka” is difficult to see even from a distance of ten meters. The owner of such a suit will definitely not need additional camouflage clothing in order to qualitatively merge with the terrain. The suit “Gorka” in this version of execution quite deserves to be called universal. It is designed to be worn in low activity mode. You can stand on the room in the process of a driven hunt or wait for the beast in ambush at the path in such a “Gorka” for a very long time in frost and blizzard, without at all experiencing the slightest discomfort from the sharp wind and cold. 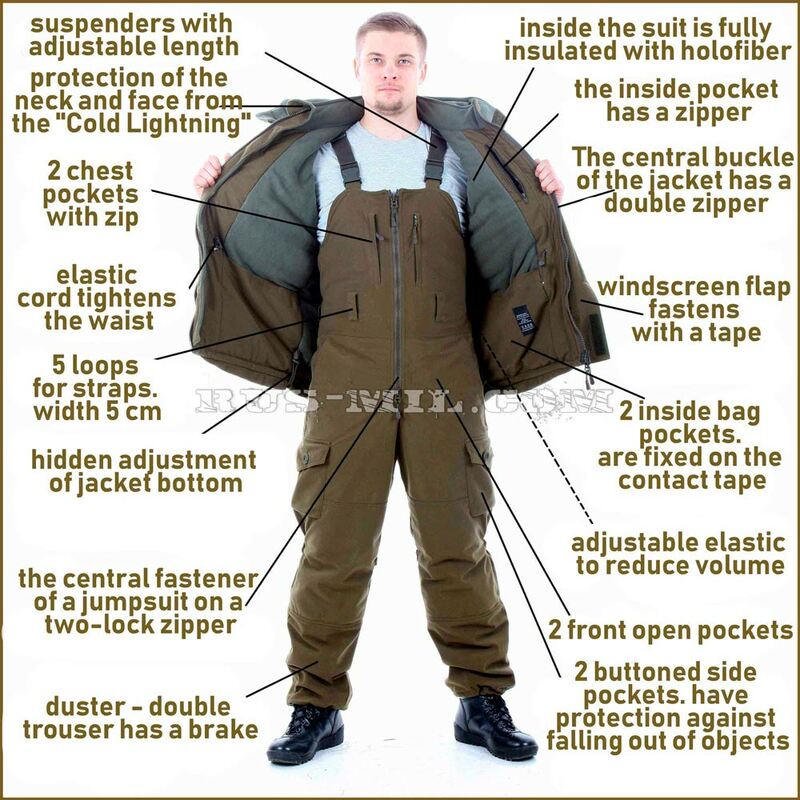 The suit is ideal for winter fishing, for trips in open transport – on a snowmobile, quad, off-road vehicle with an open top. 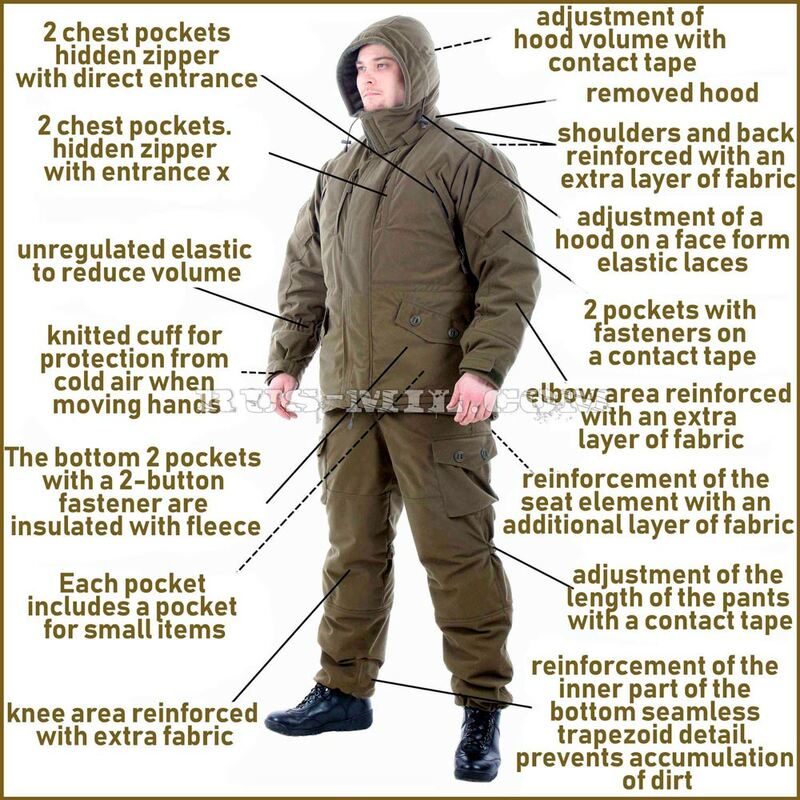 The suit has an upper insulating layer made of membrane fabric. On the front side, this material has a coating of soft, fleecy knitwear, thanks to which this one does not rustle. It is the membrane that provides windproof properties to this suit. It is not blown, it does not let water through, it does not trap liquid dirt. This material does not change the properties in the cold, perfectly cleaned, does not fade in the sun, does not get stuck. Membrane Gorka-winter suit in SnowStorm suit is insulated with an elastic nonwoven fabric soft hollofiber, which consists of specially curled fibers. This is a light material that allows warm air through the fibers, but does not allow thermal energy to go outside. This ensures the redistribution of warm air inside the suit and creates a uniform temperature environment for the body. In addition, holofiber soft has good vapor permeability, is not afraid of water. It does not crack, does not go astray – serves for a long time faithfully for the whole life of the product. Thanks to the listed properties and qualities, holofiber soft is actively used today in special professional and sports winter clothes. As a lining for the jacket and semi-overalls, the manufacturer used a warm, dense fleece. The manufacturer did not use this material only in the sleeves and trousers – from the knees and below. There he was replaced by the usual taffeta – a fabric that perfectly slides and which is designed to simplify the process of removing and putting on this kit. The “Gorka” winter camouflage suit was created specifically for hunters and fishermen, as well as for snow safari lovers who prefer to move through forests and valleys on open SUVs and fast snowmobiles. The suit forms a uniform insulating shell that can withstand significant wind loads. In the sleeves there are additional cuffs that protect against blowing and fine snow dust.